Gli Uffizi - FLORENCE LIVE! 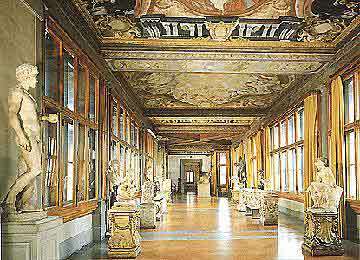 The Uffizi Palace is one of the most loved monuments of Florence. An architectural work of great importance, that shelters masterpieces of inestimable value. Comissioned by Cosimo I, it was designed by Giorgio Vasari around the middle of the 16th century. 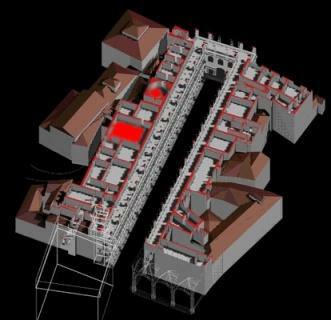 In order to realize the project, Vasari had some of the buildings surrounding the area demolished. Among these the church of San Pier Scheraggio, in via della Ninna. The intention of Cosimo I was to build a palace that could host the thirteen administrative and judicial Magistrature or Uffizi, from which the palace will get its name. 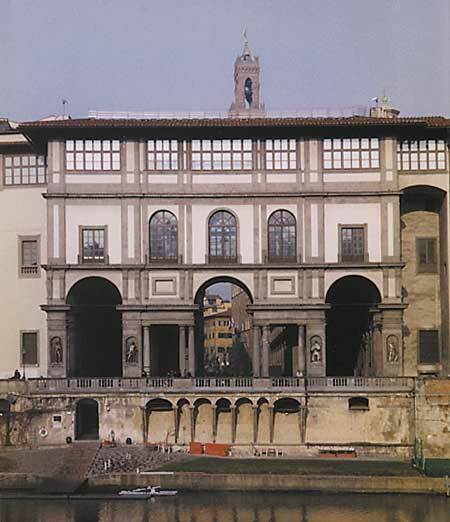 When Vasari died, the construction of the Uffizi was handed over to Buontalenti and to Alfonso Parigi. Buontalenti projected the Teatro Mediceo according to the will of Francesco I, the son of Cosimo I, in 1586. When Florence was the capital of Italy the theatre was the seat of the Senate. The building has the unusual and singular horseshoe shape, also called U shape, which opens towards the Arno River. The two bodies of the building are parallel and conjoined by a connecting corridor that has six big arched windows that open over the courtyard of the palace and over the Arno River. The two floors of the building, divided by string courses, stand over a portico that runs along the whole length of the palace and is sustained by pillars. In the niches of the portico are the statues of the Florentines who distinguished themselves from the Middle Ages until the 19th century. At the present day the Palazzo degli Uffizi hosts one of the most admired and visited museums in the world for the quality of its artworks and the history that accompanies them from the 13th century to the 18th century: the Uffizi Gallery. In 1993 the Palace was involved in the bombing attack at the Accademia dei Gergofili undergoing damages and loses of inestimable value; another act of vandalism against a patrimony of the world that managed to resist and to win returning, after a long restoration work, to its original splendour.